Today, I’m going to share with you some tips and best practices that top manufacturing companies use to set and achieve cost targets in order to maintain or increase profitability and competitiveness. 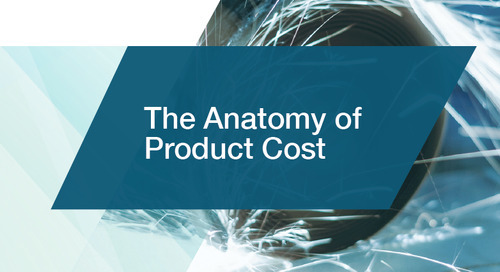 You have probably heard that most of a product’s cost is cemented during the design process. In fact, studies show that typically 60% to 80% of a product’s direct cost – depending on your industry – is set during the design stage. In order to be profitable, companies are realizing they need to establish cost targets that their engineers can work to, and they need to have practices that enable them to achieve these targets consistently. 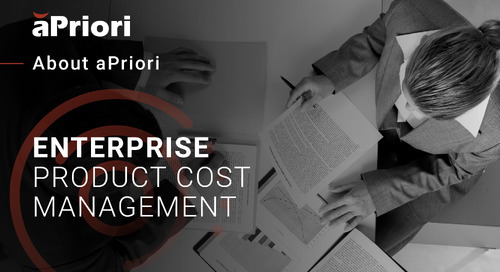 One of the most common methods of establishing product cost targets is to use the “similar to” method or the “what did this cost last time” method in which companies review prior products, parts, and purchases and then set cost targets solely based on what it cost in the past. While previous costs can be helpful to know, new cost targets should not be based solely on that information because the previous costs have no bearing on future profitability. 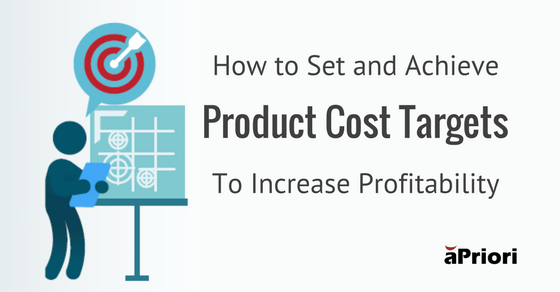 Another common method of setting cost targets – used by most successful organizations –begins with establishing a market price for the product to be developed. They do this by conducting market research to determining the value the product will bring to the market and adding some dollar amount to that based on competitive intelligence regarding their reputation (brand quality/reliability) and the cost of other alternatives out in the market. A third method companies use to set product cost targets is to establish a price by figuring out what something is going to cost them and then adding the profit that they want to make on top of that. That may work in some instances, but in most cases, using that method could leave them at a competitive disadvantage or they may find that they’re actually leaving money on the table. In order to establish proper cost targets, you need to first establish a market price, then subtract the amount you want to make for your potential profit. The difference is the target cost for the product. I’ll call this the whole product cost target. I call this, as Jack Welch use to say, “right to left thinking.” Once you have the whole product cost target, then you can establish what each component should cost. Figure 1. Opposing methods for establishing cost targets: starting with expected cost vs. starting with market price. Suppose that you currently offer a 20 inch lawnmower and a 24 inch lawnmower, and are embarking on a development process that will allow you to offer a 30 inch mower. You have determined from your market research that the target market price for this mower is $275. Furthermore, you know that your distribution costs and the profit your retailers take will total $100, and you want a profit of $50 per unit. That leaves you with $125 for your target product cost. This is the whole product target cost because it is a top level target cost and is not at a level that your engineers can work to. Next, you look at the current costs of an existing mower, not to set the cost of the new components, but to determine the cost of the major sub-functions (motor, cooling system, chassis and controls, wheels and drive, and the bagging system) and calculate the percentage of the total cost for each. Then apply those percentages to the $125 target cost you derived from your market price for the new mower to determine the target cost for each sub-function. So if the current cost of your 24 inch mower is $100 and you break it down into the major sub-functions, you know, relatively speaking, how much each one of these sub-functions costs. Note that the actual $30 for the chassis and controls is not important. It is the percentage that is important. Figure 2: Use current cost to calculate percentage of cost for each major sub-function. Next you look at your new mower, the 30 inch mower, which has a target cost for the whole product of $125. You know that if you apply the percentages to the sub-functions, the target cost for the motor is $37.50, for the cooling system is $12.50, and so on down the line all the way until you get to the bagging system which is another $12.50 because that was 10% of the total product cost, and 10% of $125 is $12.50. Figure 3: Use whole product target cost to calculate target cost of each sub-function. At this point, you have your cost broken down by sub-function. However, you need to go all the way down to the component level, where the engineers actually design and build costs into the product from the bottom up, and calculate the percent cost of each one of your functions down to the component level. For example, for the bagging system, you would have a support system that a single engineer is likely to work on. If you look at the individual components, you may find out that, in the current bagging system, you have two brackets and two mounting plates that make up the support system for the bag. If you add the cost of those components for the 24 inch mower, it adds up to $5 or 50% of the bagging system; with the bag itself making up the other 50%. The target cost for the 30 inch mower bag support is then $12.50 times 50%, which gives us $6.25 which the engineer designing the support for the new bag will have to hold to if you want to meet your cost target. As I mentioned, the design engineer for the bag support has a cost target of $6.25, but he or she does not have to do a similar design as the prior support system. They don’t have to have brackets for example or mounting plates. They could go in a completely different direction as long as they hold to the same target cost. In this example, let’s say the new bag support for the 30 inch mower is going to have a couple of hinge hooks and a resting frame. If the hinge hooks is designed to cost $1.25 and the resting frame is designed to cost $2.50, that gives us a total of $3.75 against the cost target of $6.25. In that case, that engineer would have identified about $2.50 of potential cost avoidance for that sub-assembly. Up to this point, I have described how to set target costs at a level that an engineer can work with. Next, I will explain how you can achieve them. One of my favorite public speakers, Zig Ziglar, used to tell a story about Howard Hill. Howard Hill was an archery champion. He entered 196 archery competitions and won each and every one of them. He could hit the bulls-eye at 50 yards and split the first arrow with the second one. Now, Zig used to say that, “Even I could beat Howard Hill in an archery competition any day of the week as long as Howard Hill was blindfolded and I would turn him around a few times so that he didn’t know where he was.” Because truthfully, it is impossible to hit a target you can’t see especially if you don’t know where you are relative to that target. The secret to hitting cost targets is, one, having them, because you can’t hit a target you don’t have, and two, knowing where you are relative to that target. 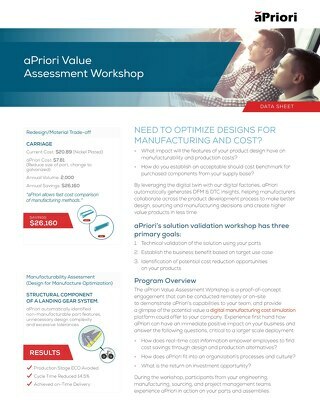 So, the next step after setting your cost targets is giving your design engineers tools to be able to estimate the cost of their designs, so they know where they stand relative to that target you just gave them. 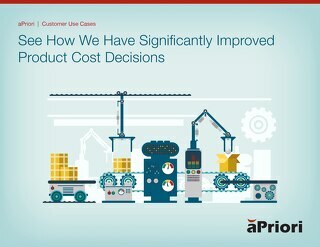 Product cost estimating tools allow engineers to estimate, in a fairly easy manner, what the cost of manufacturing their design is, at different stages of the design process. These tools and their cost estimates, though they may not be exact, provide excellent guidance, indicating to the engineer whether they are over cost or under cost and relatively by how much, whether it is a lot or a little. With the most advanced cost estimating software, your engineers can estimate a cost from the moment they have a CAD model. Then, every time they make changes, the updated CAD model can be re-evaluated and the tool can generate a revised cost for the new design and nearly immediately, give the engineer feedback regarding the magnitude and the direction of the cost impact of the design changes. In this way, engineers can fluidly assess different design alternatives that they might be considering. 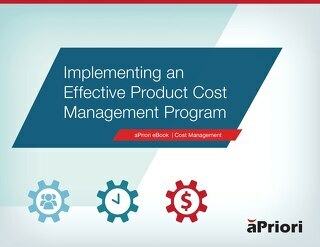 These product costing systems also provide information regarding what in the design is driving the cost – Is it materials? Is it the manufacturing process? Is it a particular feature? – so the engineer can then make the right decisions regarding their design alternatives. Well, these best in class companies are more than twice as likely to have implemented a feature-based cost estimating process. 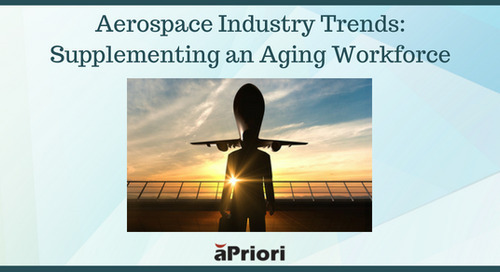 These processes can be driven by a software tool or spreadsheets supported by experts who are advising engineers every step of the way. There are many different ways to do this, but these organizations have the capability to identify cost drivers during the design phase and assess the cost impact of different design alternatives. They are able to conduct design tradeoffs based on cost, not just performance. They have visibility into the manufacturing cost implications of their designs. Aberdeen also found that these top level companies are much more likely to set cost targets at the component level, where design engineer can make an impact. Finally, I’d like to talk to you a little bit about optimizing costs during the development process. During an NPI program, most of the time, schedule is king. After you get a design that performs as you wish it to perform and has the quality and reliability that you expect it to have, there is a lot of pressure to release that design, and little time to try out alternatives solely for the purpose of reducing manufacturing cost. Therefore, I suggest you focus your cost optimization efforts on components, which are likely to have the most savings opportunity. To do this, you need to analyze your designs in two different ways. With the first method, if you have a previously designed part serving the same purpose as your new part, but it looks completely different, use your cost estimating system to cost both the old part and the new part, then divide those costs by the applicable weight of each one to get a ratio. That ratio provides an indication of the cost effectiveness of your new design versus the old design. If the cost estimate for the old design is $4 and the weight is 0.8 lbs., then you have a ratio of $5/lb. Using the same calculation to make an apples to apples comparison, the cost estimate of the new design is $7 and the weight is 1.0 lb. for a ratio of $7/lb. In this case, your new design is not nearly as cost effective as your old design. It may behoove you to spend time optimizing that part. The second method for analyzing the cost effectiveness of your design, once you’re done with developing most of your product, requires grouping similar parts, for example, all the aluminum castings, all of the sheet metal brackets, or all of the sheet metal steel parts that weigh less than 10 pounds, etc., and plotting their estimated cost versus their estimated weight. Figure 4: Identify outliers by comparing cost versus mass of similar part types. The plot will show most parts lie along a relatively straight line, but there will be a few that lie outside that line, call them outliers. The reason parts lie outside the line is because something about the design of those parts is making them more expensive relative to their weight. Those are the parts you should look at to see what can be done to reduce the cost of those parts and bring them closer to the average part cost per mass. I hope you find these tips on how to set and achieve cost targets helpful. Keep in mind, that the profitability of your products greatly depends on you setting cost targets, knowing where you are relative to those targets during the design phase, and then taking action to meet those cost targets. For more information about how to consistently hit your cost targets on NPI projects, download our whitepaper, Meeting and Beating New Product Cost Targets. 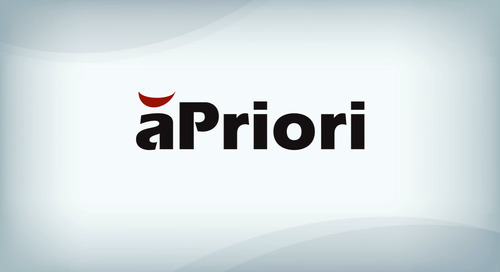 Is aPriori Right for You? Discrete manufacturer of lift trucks gains a competitive advantage through product cost management while ensuring a streamlined and efficient project schedule. Read the case study. aPriori has 10+ yrs. 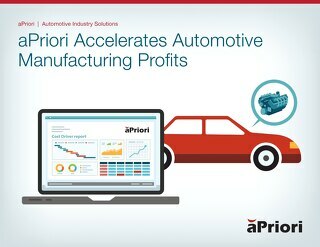 of successful experience in the automotive industry rapidly deploying enterprise Product Cost Management (PCM) solutions in complex global product development & mfg. environments.